The Wolf 48 Inch Dual Fuel Ranges: the DF484CG or the DF486G? » Which Wolf 48 Inch Dual Fuel Range: DF486G Or DF484CG? Is a Wolf 48 inch range worth it? This article will look at two Wolf 48 inch dual fuel range options in enough detail to answer that question. The 48 inch range and the 60 inch ranges are the only two Wolf range sizes that feature two ovens. The Wolf 48 Inch Dual Fuel (the DF486G), has a large and a small electric oven and a big rangetop cooking area. 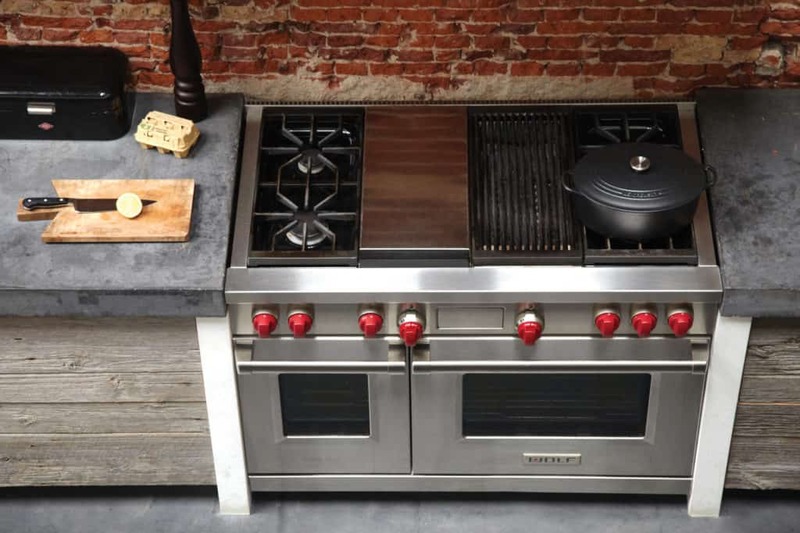 The rangetop has six burners and an infrared griddle. 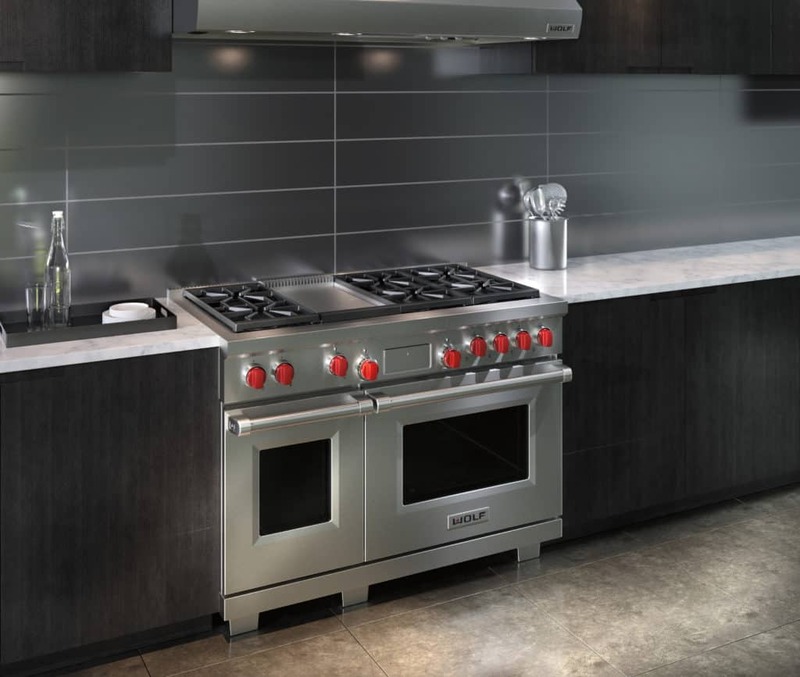 The DF484CG has the same oven configuration as the DF486G but has four burners instead of six on the rangetop. It also has an infrared charbroiler in addition to the infrared griddle. The information here will help you decide which range makes most sense for you. Also important, you will also learn whether each is worth the price and whether the Wolf brand delivers. What Are Wolf Dual Stacked Burners? What’s On The DF486G And DF484CG Rangetops? What About The Infrared Griddle And Charbroiler? What Are The Interior Measurements Of The Large (30 Inch) Oven? What Are The Measurements Of The Smaller (18 Inch) Oven? What About The Convection Cooking System? What About The Power Ratings And Number Of Passes In The Electric Element? What Are The Oven Features In The DF486G and DF484CG? What Are The Different Oven Modes? So Which Range Do I Choose? Of course, with Wolf, the quality of the “fit and finish” is the first thing to note. Wolf builds these ranges to last. Wolf stress tests their ranges at their factory in Madison, Wisconsin to make sure they hold up to heavy use. They expect these ranges to last at least 20 years, so factor that into the price you’ll be paying. A lower quality range, for instance, just won’t last as long. You will have to replace it more frequently. Add those replacements up over the 20 year plus designed longevity of a Wolf range and the lower cost alternatively may actually cost more. Another nice Wolf touch, you can call them in Wisconsin any time, day or night, with any questions or issues you may have! In addition to very high durability compared with other ranges in the pro-style range category, Wolf is also a very iconic brand. A Wolf range makes a statement in your kitchen and will definitely stand out among your other appliances. Keep that in mind when planning that important dinner party. The red knobs burner knobs on Wolf ranges are as distinctive as the Wolf name. You also now have the additional option of choosing black or stainless steel knobs. The Wolf history goes back to Los Angeles in the early 1930s, where the Wolf brothers established the company that is now part of another iconic brand, Sub-Zero. More details on Wolf’s history can be found in this detailed Wolf range product guide. Dual stacked burners on both the DF486G and DF484CG ranges provide the full spectrum of Wolf burners. They range in power from “melt mode” in the 9,200 BTU burner to a pretty hot 20,000 BTU burner. The high heat 20,000 BTU burner will provide enough heat for almost any high heat application when both gas rings of gas jets are engaged. The “dual” nature of the burners refers the two burners rings in each Wolf burner, stacked on top of one another. When the iconic red Wolf range knob is turned one way, the lower burner ring only is engaged. From there, the knob will allow you to set a wide range of simmer settings. Turned the other way, both burner rings are engaged for the highest heat settings. The consistent low simmer settings are a Wolf staple and are among the best in the pro range category. Most other simmer settings accomplish a low heat output by turning the burner off and on. Wolf does not, it maintains the simmer whichever simmer setting you set at the same consistent temperature. These burners are sealed, like most pro style ranges for the home, but a few other brands feature open burners. 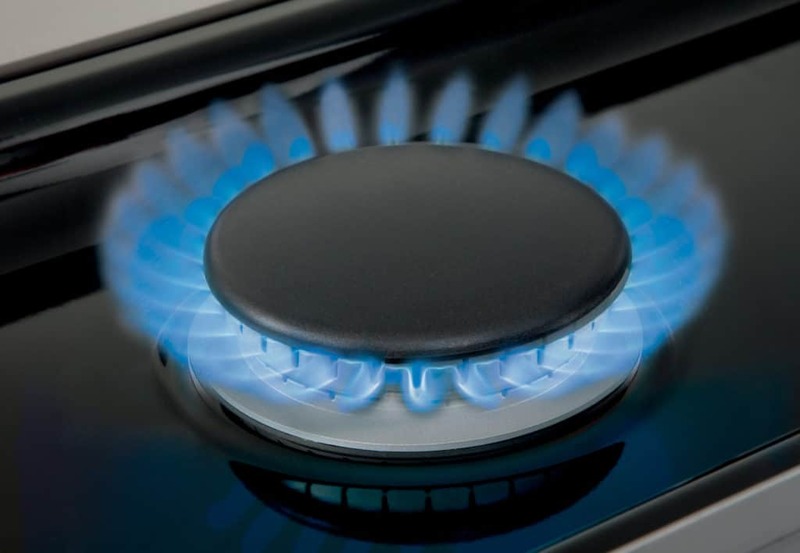 Open burners provide more direct heat and are the type you’d find in a commercial kitchen. Most cooks, however, don’t need that kind of heat unless you think you’d notice the difference (cooking commercially maybe?). Otherwise, sealed burners are probably a little safer in your home and are always much easier to clean. 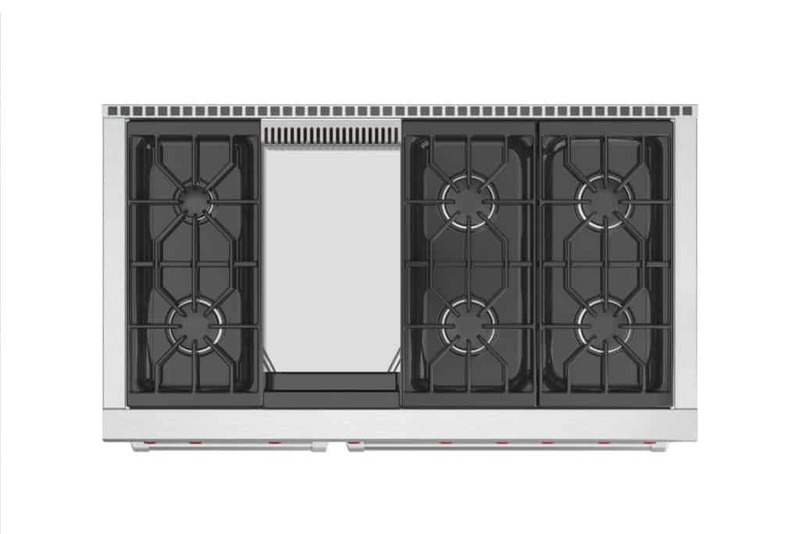 The DF486G: Six burners – two on the left, separated by the infrared griddle and four burners on the right. The six burners include one 9,200 BTU burner, two 15,000 and two 18,000 BTU burners and one 20,000 BTU super burner. Each burner is dual stacked to provide a low simmer at 300 BTUs, up to each burner’s highest rating. The 12 inch wide griddle is powered by a 15,000 BTU burner that is designed to evenly provide radiant heat evenly across the griddle surface. It’s great for cooking everything from stir fry to steaks to burger, eggs, and almost anything else you might think of. The griddle includes a cover that will enclose the griddle and provide a seamless surface with the adjacent burner grates. Also, there is an optional Wolf accessory for the griddle is an eleven inch maple wood cutting board. The rangetop collectively provides 110,200 BTUs of cooking power across the entire surface. The DF484CG: From left to right across the range, two burners on the far left, followed by the infrared griddle, the infrared charbroiler. The other two burners are located on the far right of the range. The DF484CG provides almost every option that Wolf offers. The griddle and charbroiler are nice compliments to the burners, just make sure you have enough ventilation for all that heat. The griddle and charbroiler grill are both great for a cooking a lot of food, not just breakfast. You will be able to cook burgers, other meats, or just about anything else, depending on whether you want a more even fry on the griddle or a sear on the charbroiler grill. The charbroiler is similar to what you’d get from your backyard barbeque, but cooked inside. The griddle is probably more versatile, since it’s a uniform flat cooking surface. It’s also bigger than any pan. You can even use with cookware on top of the grill for indirect cooking. The charbroiler has high heat in the front of the grill and lower heat in the back. This gives you the option to charbroil on the front and warm on the back of the grill. Also, the charbroiler burner’s direct heat is quick to bring the grill to temperature. Collectively, the DF484CG provides for so many cooking options that even a practiced multi-tasker will be kept pretty busy while using all of them at the same time. The total output of the range is 93,200 BTUs. The two electric ovens in the 48 inch range in both the DF486G and the DF484CG have one small and one large oven. The large oven on the right side is a 30-inch oven, the same oven as in the Wolf 30 inch dual fuel range. On the left side is the smaller 18-inch oven (Wolf makes a slightly smaller countertop oven, the Wolf Gourmet Countertop Oven if you’re looking for a third oven in your kitchen! Read the full review here). The 48-inch range is great when you need to cook multiple dishes, like a roast in the main oven and an apple pie in the smaller oven. The 30-inch oven provides 2.8 cubic feet of usable interior capacity and over 4.5 cubic feet of total interior oven space. This is the main oven in the range. It is a great size for cooking large cuts of meats, even if a turkey is the biggest thing you cook all year. Of the two oven interior measurements, use the smaller (2.8 cubic feet) measurement to understand how much stuff you can fit in your oven, since it subtracts space taken up by racks and other oven components that are already inside the oven. The larger interior measurement (4.5 cubic feet) is what you should use when comparing oven interiors from other brands with Wold, since that is how oven interior size is usually given. The same interior measurement difference also applies to the smaller oven. The smaller oven is good for small meals and re-heating, or just cooking smaller sized food. Its usable interior oven space is 1.5 cubic feet and the total interior size of the oven is over 2.5 cubic feet. The larger oven interior is 25 inches wide, 16 ½ inches high and 19 inches deep. The smaller oven interior is 14 inches wide and also 16 ½ inches high and 19 inches deep. It’s also great to be able to cook two completely different dishes simultaneously without cross-contamination. When you’re cooking a pot roast in the main oven and a cheesecake in the smaller oven you probable don’t want those flavors to mix. Each of the two electric ovens is a convection oven. The large oven is a dual convection oven with two convection fans, each fan has its own heating element. This is an ideal convection system since each fan is able to distribute hot air directly from the fan and evenly spread that hot oven air around the oven. This will definitely get rid of “cold” spots that you may have become used to in other ovens. 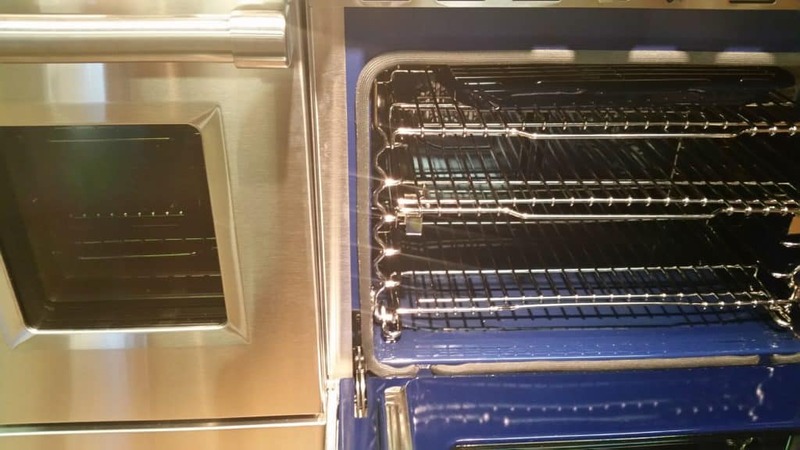 The smaller oven is a single fan convection system that also adds its own heating element to the oven’s existing broil and bake heating elements. The single fan still does a nice job of spreading oven air around the oven this smaller sized oven. The large oven includes a 3,600 watt 8-pass broil element for searing heat. The smaller oven also has a powerful 2,000 watt 4-pass broil element. The bake elements in each oven are flush with oven floor to provide more interior space in the oven. The large oven bake element has an inner and outer element. The inner element is 1,250 watts and the outer element is 1,000 watts. The smaller 18 inch oven bake element is 1,450 watts. Wolf doesn’t really detail these power settings but it’s good for you to know when you’re deciding on either one of these ranges. Also, it’s good to know that the Wolf ovens in the DF486G and DF484CG are powerful enough for super searing (even rangetop steak! ), baking, roasting and everything else. The ovens each include five rack positions and three oven racks. One of the racks in each oven can extend all the way out. This is nice to have when you’re trying to get really hot food out of your ovens. It good to know, however, that you don’t have to adjust your racks often. 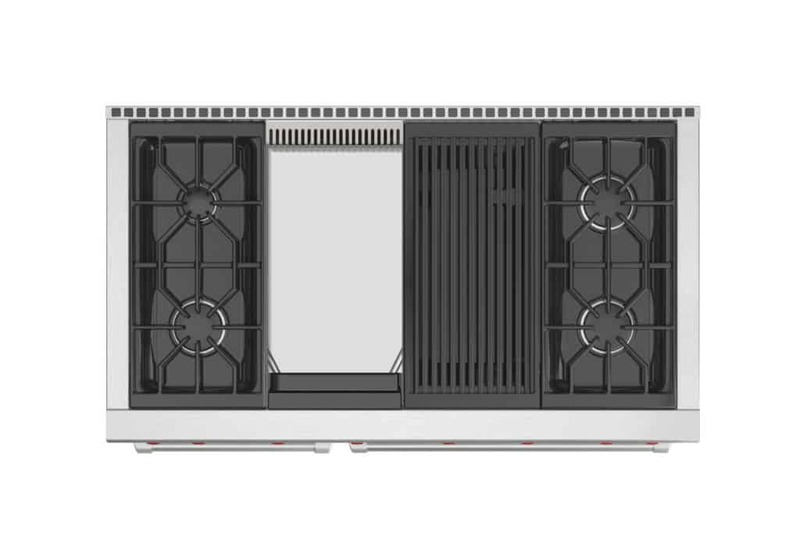 The dual convection dual heating elements will distribute oven air very evenly. Each of the two ovens in both the DF486G and DF484CG feature multiple cooking modes. They are controlled through a combination of Wolf’s iconic red oven knobs (and to remind you, you can choose black or stainless steel instead) and a control panel. The control panel disappears into the range if you don’t want to see anything electronic on your range. The control panel also works with the temperature probe in the larger oven to alert you when you food has reached your desired internal temperature. You don’t have to keep checking! You just have to know where to place it in whatever you may be cooking. Use the control panel to tell the oven how long to cook, or when to start cooking, or not cook at all if the Star K certified Sabbath mode is selected. The oven modes are: convection, convection bake, convection broil, convection roast, bake, broil, roast, dehydrate, bake stone (large oven only) and proof. Some of these modes, like dehydrate, may be new to you. Dehydrating is a nice way to preserve fruits, vegetables, and even to make beef jerky. You can also use your oven thermometer in the process. The bake stone mode is for cooking with a bake stone (accessory by Wolf or elsewhere) for ideal pizzas and breads. The bake stone absorbs oven heat to directly heat the bread or pizza crust like a traditional pizza oven or stone oven does. Each oven also features self cleaning cycles that use the oven’s highest temperature settings to burn off oven goo. Choose either three or four hours for the oven’s self-cleaning cycle, depending on your time and preferences. Interrupt the self-cleaning cycle at any time you want on the control panel. You don’t have to worry about heat loss or even risk of failure over this oven’s very long life since these oven doors are triple-paned. Also, know that each of these ranges also weigh about 685 pounds. The warranties on both these ranges are for one year full warranty and three years for major parts (see the details in the comprehensive Wolf range guide here). You’ve read about the Wolf quality and durability. Do the math over twenty years and compare it with anything else. Chances are that Wolf looks like a good bet. Also realize that your Wolf range is going to make a statement in your kitchen and even in your home whether you realize it or not. Factor that into your decision as well. So, if you’ve decided that you’re going with Wolf for the long haul, you have several choices. Your choice of range between the DF486G and DF484CG ranges comes down to the rangetop configuration, since each range has the same ovens. It really comes down to whether you want two more burners or a infrared charbroiler. Go with the DF484CG if you find yourself pining away for barbequed meals in winter or just want another way to cook on your range. If, on the other hand, you just need more burners to use all of your pots and pans, then you should go with the 486G.